Some brands choose to capitalize on social media trends by joining the conversation and attempt to draw some attention. That’s not necessarily a bad idea, but it’s so easy to do it in the wrong way (See: Kenneth Cole) and anger thousands of customers. Yesterday, AARP joined the conversation with #NotoriousAARP tweets and requests for fans (plus artists like Jay-Z, MC Hammer, Justin Timberlake and Snoop Dogg) to submit ideas for #AARPrapsongs. 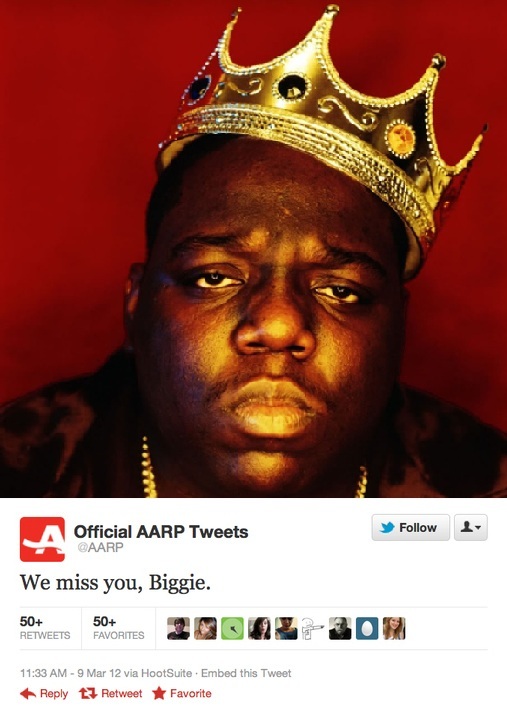 “We miss you, Biggie,” their official account posted Friday morning, sparking a conversation that was dubious at best. As one blog pointed out, it sounded like someone’s grandson was running the association’s official Twitter account instead of their target older audience (who may or may not still be having trouble with webcams). That’s when social media is making a mistake — know your brand’s voice and, perhaps more importantly, know your audience. Notorious B.I.G. would have turned 40 this year. Even if the AARP really has a significant number of members that are in their early 50s, a 50-year-old still would have been 34 when the single “Big Poppa” earned the rapper his first Grammy nomination in 1996 — already out of the age demographic of MTV and radio stations that would have played his songs. Luckily, AARP hasn’t seemed to spark much of a furor — yet. Most of their members may still be figuring out this “Facebook thing” and haven’t even heard about what’s going on Twitter. And in case you were wondering, their Facebook page has zero mentions of Biggie. All they posted yesterday was pictures of a puppy contest called “Mutt Madness” and a link for members to get 10% off from exercise equipment from Smooth Fitness, which bears repeating my other point: keep your social media voice consistent. By the way, for those hoping for a light at the end of the tunnel, @AARP still thinks their audience is a twentysomething (or even thirtysomething) hipster. “Working on a Storify curating the top #SXSW news, ideas and info for 50+… Tweet us if you hear something cool,” their Twitter account posted on Saturday morning. Twitter is an increasingly fun way to watch live events on TV. By following live-tweets with a #hashtag, you can be watching alone in your pajamas but feel like you’re at a party with thousands of fellow fans who are making interesting observations and comments. That being said, there’s an important rule for live-tweeting any event — if it’s on TV and being watched by millions, DO NOT TWEET A PLAY-BY-PLAY. Posting “I can’t believe she won that award!” or “And Otis Spunkmeyer passes it to Scrooge McDuck, who scores and puts the Lone Rangers on top” serves no value to a nationally televised event considering other people can watch the same thing — its redundant and annoying. Use Twitter to add a third dimension to the game or show by posting original content or unique reactions. With that in mind, I started live-tweeting Syracuse University basketball games with #lipreading tweets of what players and coaches, especially Jim Boeheim, are saying when the TV shows close-ups of their faces. Since there’s no audio from them in those shots, I’m adding an extra element to the game that viewers who aren’t deaf and hard-of-hearing likely can’t follow. I got the idea for specifically focusing on tweeting lipreading (or lip reading, speechreading) from a German deaf woman, Julia Probst, who reads the lips of soccer players and coaches during matches and tweets them, providing fans with a running dialogue that they would otherwise not be privy to. It’s made me enjoy sports more and I hope to continue it with Orange football this fall and other teams I’m a fan of, like the Boston Celtics, New England Patriots and the Boston Red Sox. #Lipreading Jim Boeheim: “Listen. LISTEN! You can’t be fouling like that…” to SU’s Rakeem Christmas #GoOrange #BeatWVU. Everyone can lipread a little bit, whether they realize it or not — being hard-of-hearing, I did speech therapy as a kid so I could understand speech (as well as speak it better). 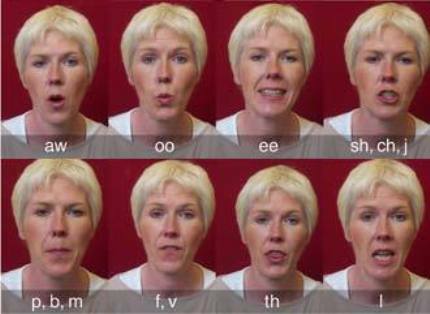 Lipreading is simply the visual interpretation of the movements of the lips, face and tongue. Without hearing aids, I’m 90% deaf but with lipreading, context and residual hearing I can follow conversations pretty well most of the time. If you can’t lipread, don’t feel bad — just add something different when live-tweeting an event. Give people a reason to follow you on Twitter. When communicating with a deaf/HOH person, face them and speak clearly and naturally. People change the way they talk all the time — resting your chin on your hand affects speech, as does gum, mustaches, tongue-piercings, talking out of the side of your mouth, etc. Also, when people talk faster or slower it makes it harder to lipread and, when people yell, their mouths get wider and it becomes very difficult to see what they are saying. (Translation: Shouting at deaf people doesn’t help them understand you.) It’s very difficult to read lips on a person’s face/mouth that’s constantly moving or is facing in another direction, too.